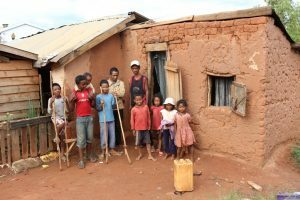 Madagascar is a beautiful country in need of partners, with almost 89% of the population living in conditions categorized as slums. These are houses that have large holes in the roofs, decaying walls, dirt floors or overcrowding — and too often all of the above. The Fuller Center is partnering with families in these circumstances to provide the opportunities that they otherwise will never have. Families are required to begin saving prior to receiving their home to demonstrate their capacity and willingness to pay it forward. Families then help to build the homes and pay the costs forward on a no-profit, no-interest loan over about five years. The program has developed low-cost methods of building and repairing homes with families. 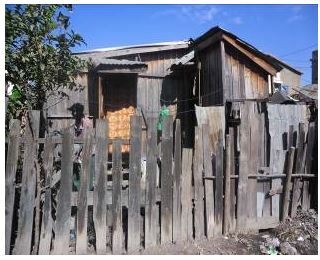 A detached sanitation building with a latrine and bathing area is included with each new home. The best way to learn about the project is to hear it from the perspective of one of our first families, Arnaud and Georgette, who live with their two children Gael and Bernice. We include it here with minimal editing for purposes of authenticity. Arnaud says, “With our low monthly revenue, the bank doesn’t accept our request to finance building our house. In fact, I am Security Agent and my wife is a teacher at a primary school. Together, we earn $100 a month for the whole family. For this reason, we have lived many years in the slum. One day, when I first heard news about Fuller Center Madagascar told by my neighbors, I joined its meeting on Saturday at the municipality hall. After this time, the hope to see my house built got more and stronger within me. The kindness that the team of Fuller Center Madagascar shared to us changed our disappointment to confidence. I was overjoyed when my application for housing assistance has been approved. Now, my new house is built in a nice place, my family will leave this unsafe and unhealthy place.